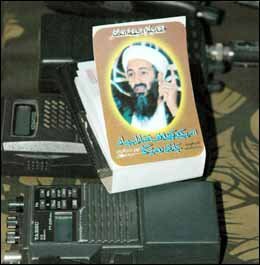 A new poll shows that public support for Osama bin Laden and terrorism has sharply declined in several Muslim countries, including Morocco.The Pew Global Attitudes Project research, however, shows that this support remains substantial overall, and has risen slightly in two countries – Pakistan and Jordan. Andrew Kohut, director of the Pew Research Center, said the results suggested that "people are tiring of terrorism in these places," perhaps because most of the countries have themselves suffered such attacks. In Lebanon, just 2% report some or a lot of confidence in bin Laden, and in Turkey only 7% do so. However, in Pakistan, a narrow majority (51%) places some measure of confidence in bin Laden, a slight increase from 45% in 2003. And in Jordan, support for the Al Qaeda leader has risen over the last two years from 55% to a current 60%, including 25% who say they have a lot of confidence in him. Declining support for terror in a number of the Muslim countries surveyed tracks with previously reported dramatic increases in favorable views of the United States. The US is viewed more favorably by people under age 35 than by older people in Morocco, Lebanon, Pakistan and Turkey. As America's image has improved in Morocco over the past year, more young people are giving the US favorable marks (53%) than Moroccans ages 35 and older (45%). A similar generational gap is seen in Lebanon, where the percentage rating the US favorably has increased from 27% to 42% since 2003. A sizable generational difference is also seen in both Pakistan and Turkey, where overall views of America remain predominantly negative, with younger people 10-to-12 points more likely to give a favorable rating than their seniors. The polling also found that in most Muslim countries women were less likely to express an opinion of the US than were men, but when they did, they held a somewhat more positive view. The polling found that in most majority-Muslim countries surveyed, support for suicide bombings and other acts of violence in defense of Islam has declined significantly. In Turkey, Morocco and Indonesia, 15% or fewer now say such actions are justifiable. In Pakistan, only one-in-four now take that view (25%), a sharp drop from 41% in March 2004. In Lebanon, 39% now regard acts of terrorism as often or sometimes justified, again a sharp drop from the 73% who shared that view in 2002. A notable exception to this trend is Jordan, where a majority (57%) now says suicide bombings and other violent actions are justifiable in defense of Islam. The latest survey, conducted among more than 17,000 people in 17 countries this spring, finds that while many Muslims believe that radical Islam poses a threat, there are differing opinions as to its causes. Sizable minorities in most predominantly Muslim countries, including Morocco and Pakistan point to poverty, joblessness and a lack of education, but pluralities in Jordan and Lebanon cite U.S. policies as the most important cause of Islamic extremism. In non-Muslim countries, fears of Islamic extremism are closely associated with worries about Muslim minorities. Western publics believe that Muslims in their countries want to remain distinct from society, rather than adopt their nation's customs and way of life. According to the research, there is a widespread perception in countries with significant Muslim minorities, including the US, that resident Muslims have a strong and growing sense of Islamic identity. For the most part, this development is viewed negatively, particularly in Western Europe. In France, Germany and the Netherlands, those who see a growing sense of Islamic identity among resident Muslims overwhelmingly say this is a bad thing. Overall, in Muslim countries, the sense that Islamic extremism poses a major national threat is strongest in Morocco, the site of a devastating terrorist attack two years ago, where nearly three-quarters of the public (73%) hold that view. In Pakistan, 52% believe Islamic extremism presents a very or fairly great threat to the country, as do 47% in Turkey. In Lebanon, opinions are divided, with Christians much more likely to see Islamic extremism as a threat than Muslims. And just 10% of Jordanians view Islamic extremism as at least a fairly great threat. Outside the Muslim world, the Pew survey finds that in countries such as India, Russia, Germany and the Netherlands, concerns about Islamic extremism – both within their own borders and around the world – are running high. Worries over Islamic extremism are nearly as high in France and Spain. Concerns about terrorism at home and around the world run parallel in only three countries, Russia, India and Spain. Before the London terrorist attacks, Americans and Britons expressed more concern about extremism around the world than they did at home. Most people surveyed in predominantly Muslim countries identify themselves first as Muslims, rather than as citizens of their country. Moreover, except in Jordan, there is considerable acknowledgement that Islam is playing a significant role in the political life of these countries. Substantial majorities in all but one of countries surveyed – including as many as 85% in Indonesia and 75% in Morocco – say that Islam plays a very large or fairly large role in the political life of their countries. The major exception is Jordan; just 30% of Jordanians now see Islam playing a large political role in that country, a sharp decline from the 73% who said so in the summer of 2002. In Pakistan as well, those seeing substantial Islamic influence in political life have also declined in number – from 86% in 2002 – but remain in the majority (62%). Only in Turkey has the proportion of those seeing a large Islamic political influence increased substantially, from 41% in 2002 to 62% currently. For their part, people in predominantly Muslim countries have mixed views of Christians and strongly negative views of Jews. In Lebanon, which has a large Christian minority, 91% of the public thinks favorably of Christians. Smaller majorities in Jordan and Indonesia also have positive views of Christians. However, in Turkey (63%), Morocco (61%) and Pakistan (58%), solid majorities express negative opinions of Christians. Anti-Jewish sentiment is prevalent in the Muslim world. In Lebanon, all Muslims and 99% of Christians say they have a very unfavorable view of Jews. Similarly, 99% of Jordanians also think the same. Large majorities of Moroccans, Indonesians, Pakistanis and six-in-ten Turks also view Jews unfavorably. Is banning Muslim Head Scarves a good idea? Majorities in the U.S., Canada and Great Britain, as well as pluralities in Spain, Russia and Poland, view such bans as a bad idea. However, in France, a large majority (78%) favors such prohibitions. They are joined in this view by smaller majorities in Germany (54%), the Netherlands (51%) and by two-thirds of the Indian public (66%). In Turkey, 64% of the public calls such a ban a bad idea, as do large majorities in Jordan (97%), Indonesia (95%), Morocco (90%) and Pakistan (77%). In Lebanon, nearly all Lebanese Muslims (99%) disapprove of a ban on head scarves, but 71% of Lebanese Christians approve. The report said that in most non-Muslim countries, opinions on policies that bar Muslim women from publicly wearing head scarves are related to perceptions of Islamic separatism and concerns about Islamic extremism. Majorities or pluralities in the US, Canada, and every European country, other than France, judge that some religions are more prone to violence than others. And when those taking this view are asked which religion they think of as more violent, Islam is designated by large majorities in each of these countries. For the most part, people in predominantly Muslim countries are less likely to express the view that some religions are more prone to violence. Only in Jordan does a large majority (75%) say that some religions are more violence prone than others, with 98% of those holding this view pointing to Judaism as most violent. Similarly in Morocco, a 40% plurality views some religions as more violent than others, with most (83%) pointing to Judaism as most violent. In Pakistan, a 40% plurality views some religions as more violent, but while half (51%) choose Judaism as most violent, 31% designate Hinduism. Fewer than 20% of Lebanese and Indonesians deem some religions more prone to violence than others; among these respondents more than six-in-ten in both countries (66% and 63%) select Judaism as most violent, with the rest split about evenly between Christianity and Islam. In Turkey, however, about a quarter (26%) of the population subscribes to the view that some religions tend to violence more than others; a plurality (46%) points to Christianity as the most violent. The Pew Global Attitudes Project is a series of worldwide public opinion surveys encompassing a broad array of subjects ranging from people's assessments of their own lives to their views about the current state of the world and important issues of the day. The Pew Global Attitudes Project is co-chaired by former U.S. Secretary of State Madeleine K. Albright, currently principal, the Albright Group LLC, and by former Senator John C. Danforth, currently partner, Bryan Cave LLP. The project is directed by Andrew Kohut, president of the Pew Research Center, a nonpartisan "fact tank" in Washington, DC, that provides information on the issues, attitudes and trends shaping America and the world. The Pew Global Attitudes Project is principally funded by The Pew Charitable Trusts. The William and Flora Hewlett Foundation provided a supplemental grant for the 2002 survey.